Here’s a map of all the buses on the road in Detroit. And it’s a live map — every couple seconds, you’ll see the dots move as we get updated position information. You can hover over dots for details on the route. We made this map for a couple reasons. First of all, it’s fun to watch the buses move. And it’s an interesting picture of the overall status of the system: you can see the city in motion. There’s a couple other uses; you can zoom in to your house and use it to know when to head to the bus stop (though we recommend using an app like Transit or Stop313 for that). Here’s how we did it: The data comes from the TextMyBus API. You may know TextMyBus from it’s cell phone fame: you can text in your location to 50464 to get real-time bus arrival info. Over 42,000 people have sent & received more than 2,500,000 messages. But the data behind it is also free & open, and it’s used by several mobile apps. We’re using it here to make this little map, and we’re excited to see what others make with it. There are some caveats to the data. The data isn’t accurate to the second: buses only update their location every minute or so, and it takes some time to receive and process the data. The map also doesn’t show untracked buses. That means buses that are scheduled to be on the road but aren’t won’t show up. It also means that if the bus’s GPS is broken, we won’t display it. If you notice anything wrong (like a bus not coming when it’s shown on the map), leave a comment here or email us at info@localdata.com. Definitely worth checking out! 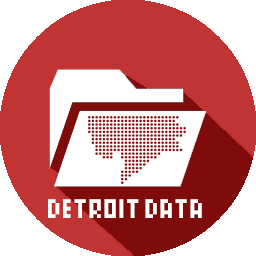 DETROITography puts out some really cool and informative material.